This page is about the German twin-engine fighter Me 410 A-1/U4. For other uses, see Me 410 (Family). The Me 410 A-1/U4 is a rank IV German twin-engine fighter with a battle rating of 3.3 (AB), 3.7 (RB), and 4.0 (SB). It has been in the game since the start of the Open Beta Test prior to Update 1.29. The main point of focus on this vehicle is the 50 mm BK 5 (50 mm) cannon in the nose. For its size, it holds a very respectable 22 rounds of ammunition. The speciality ammunition belts consist of one "Armored target" belt loaded with APCBC-HE-T rounds, a second "Armored target" belt loaded with HVAP-T (APCR) rounds, and one "Air target" belt with minengeschoße HEI-T rounds. However, the default belt contains a one to one mix of the AP-T and HEI-T rounds, making it difficult to specialize a specific role in the battle. ? ? 9,400 ??.? ??.? ?.? ?.? ? The Me 410 A-1/U4 is an air vehicle that performs well in two different roles. The first is bomber interception due to its large caliber 5 cm BK 5 cannon, but the poor climb rate when compared to other variants of the 410 limit its effectiveness in this mission. Granted, single-handedly shooting down heavy bombers is quite enjoyable from a pure game play perspective. The excellent armor-piercing capabilities of Me 410 A-1/U4 cannon make ground attack a viable option. However, the Hs 129B-3 with its 7.5 cm BK 7,5 cannon can deliver more punch to its target while an aircraft armed with 3.7 cm weapons can also penetrate the rear and side armor of all types of armored vehicles while having more ammunition at their disposal. For this reason, bomber interception might be a more viable option. 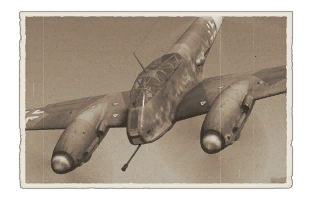 Of course enemy fighters will be your primary concern, since the Me 410 A-1/U4 has poor climb rate and turn time, but your rear machine guns with good firing radius can provide some retribution. The heavy BK 5 cannon degrades flight performance considerably, making it hard get on your opponent's rear and use your powerful MG 151/20. The best tactic to counter enemy fighters is to retain energy and use Boom & Zoom attacks. If a friendly fighter is near, make sure to ask him for help. Able to knock a B-17 out of the sky with as little as one 50 mm shell. Worst flight performance of all Me 410 variants. High-caliber cannon air target ammunition lacks versatility. 50 mm cannon is almost useless against fighters. This page was last edited on 25 March 2019, at 19:28.